Most of the people still believe that the “real” detector, its heart, resides in the so called “remote control”. Probably due to the fact that every other metal detector embeds the basic detecting electronics in the display control box or, at least, in a separate box. Since the presentation of the first Deus unit, XP has literally revolutionized this concept by moving the fundamental electronics in the coil chassis and allowing the user to control it thru a wireless remote control or even with a wireless headphone set. In other words, the “real” detector IS the coil, NOT the remote control/headset. These are just used to control the metal detector and to give audio and visual feedback to the user. Keeping in mind this innovating and revolutionary perspective, we could say that the Deus “System” is one of the cheapest machine on the market. It just asks the owner to pay a little more at the beginning: buying the remote control device (headset or remote control or both), collapsible stems and, of course, a coil/detector. Since then, it will be possible to change the operating capabilities and functionalities by just acquiring a new coil/detector without the need of anything else. It’s like having several different detectors but with one easy and familiar controller. We would not be forced to buy a complete new detector every time. Imagine the money you could save and its flexibility. XP designed a virtually limitless explandable system and, after this new HF series, based on VLF/IB technology, including the 9″ round coil running at 15, 30 and 55 kHz and an elliptic HF running at 15, 30 and 80 kHz, is working to a Deep Seeking orthogonal coils model and who knows about the future (Pulse Induction? Multifrequency? Hybrid New Tech?). With the new HF series, XP has re-designed part of the coil/detector mechanics. 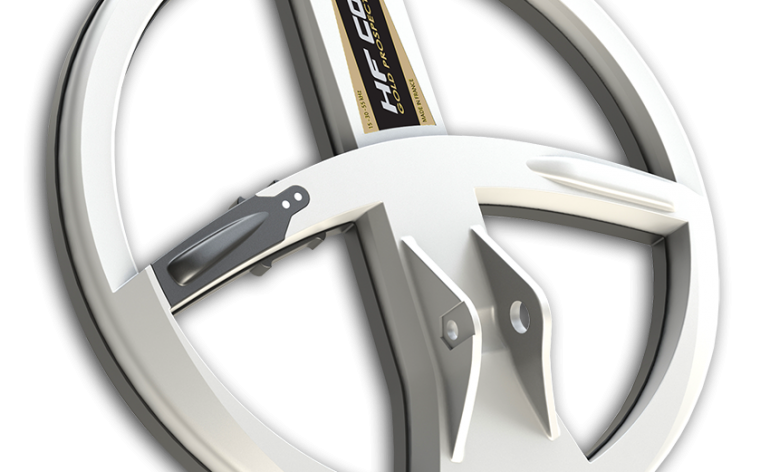 If the standard “black” coils (running at 4, 8, 12 and 18 kHz) embedded the basic electronics, windings, wireless RX-TX and the LiPo battery, in the new HF “White” models designers have pulled out the battery that now could be fitted in the lower stem. The battery will be connected to the coil/detector thru a wire than runs inside the stem (Minelab’s style). Assembling the new HF 9″ is just a matter of seconds. Following the easy instructions provided in the box, everyone will be able to be fully operating without any particular problem. By pulling out the battery from the coil chassis it will be easier (and less disruptive) to change it in case of malfuction or natural depletion (Old standard coils needed a surgical-like operation to extract the embedded battery that not everybody are able or would like to do, so a tech support is most of the times compulsory) and allowed the manufacturer to design a more balanced detector system by repositioning the battery pack on the top of the lower stem. And now the new battery is even larger and more powerful than the standard one, featuring 850 mAh, allowing a longer capacity and autonomy. To allow the remote control/headset to control the new HF device, you will need to update your Deus to the last V4.0 (or later) firmware release. The upgrade software could be downloaded from the XP internet site and will run on Windows systems (Linux/MacOs/Other platform could run it by using a Windows emulator or a Virtual Machine environment). In just few minute, by following the easy instruction on your PC’s monitor, your remote control and/or your wireless headset will be updated. By turning on the remote control a “4.0” will be displayed to assure you everything is properly working. 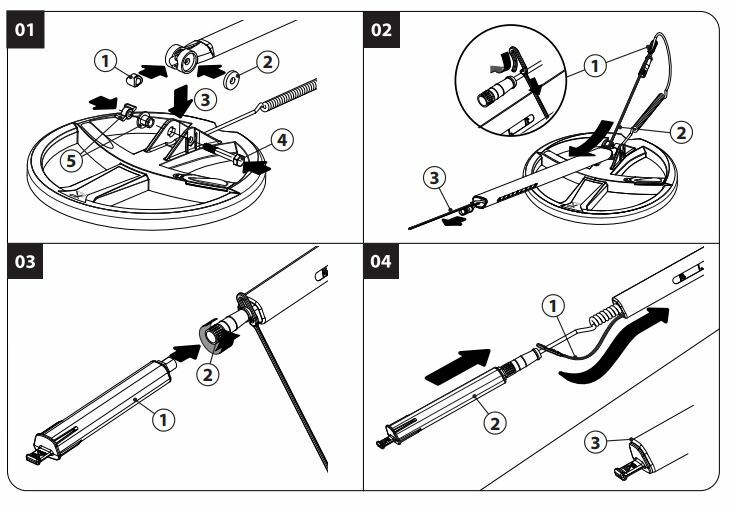 To finalize the link between the remote control/headset and the new HF, just follow the user’s manual instruction, and take care to dial in the correct coil’s serial number (you will find it on a sticker on the upper part of the HF). If everything was done correct, in just few seconds the HF will be initialized and we will be ready to use it. Of course the first thing we will do is to enter the remote control menu to check if, in the Frequency options, the new HF parameters (15, 30 and 55 kHz) are available. Those new frequencies values are the basic ones. We could slightly modify them to counteract EMI or nearby detectors disturbances. As you can see, there’s plenty of room for adequate adjusting. Note: Battery consumption may vary when using different frequencies. As stated by the manufacturer, nominal battery life when using Freq1 will be around 20 hours, while it will last longer (up to 27 hours with Freq2 and 28 with Freq3) by selecting the other ones. Don’t be surprised by this: it’s a simple electronics laws that applies to any RF emitting device. As usual, I’ve begun my tests by bringing the HF 9″ on the fields. In fact I strongly believe that air tests are almost useless, even though they could give us a general idea of theoretical coil capabilites and performances, but they will never be as reliable as a good ol’ field test in real conditions. So I’ve brought the Deus V4 on a worked field, full of wheat stubbles, low mineralized, where I had found lots of good keepers in the past. The HF lightweight immediately has made the difference. It’s a true pleasure to sweep the machine with such an agile coil on. The reason I’ve chosen the 15 kHz was motivated by having found high conductivity and not-so-thin targets in the past. In order to ground balance the machine I’ve opted to the Automatic mode since mineralization was not so variable. A few “pumps” and I was ready to go. The machine, with the above settings, ran so smoothly and stable. Just a few seconds later it signalled the first “potentially good” target under the coil. High VDI, pretty stable, around 82-84. I’ve dug that signal and a nice copper button came out. Nothing exceptional but that was a really good start. 3 minutes later and another good signal came thru my WS4 headset. I’ve dug it with my MKW stainless steel spade and a nice King Vittorio Emanuele 1865 copper coin came out at 15 cm depth. Audio and VDI were rock steady. Good job Deus! As long as I’ve continued my detecting session my appreciation for the new 9″ HF raised in a exponential way, especially for its small iron discrimination capability. Of course big iron objects can fool the machine (as well as any other detector) but, thanks to experience and some smart “tricks”, I was able to avoid digging lots of useless holes. Here’s a good tip for beginners… Try to do your best to “center” any possible good target under the coil. The more you will center it, the better the signal data will be fed thru the machine’s analysis circuitry. In other words, less trash and more fun! Take your time to correctly pin-point the target using any possible mean. The above tip is even more important when handling big iron pieces or when using the machine with extreme Sensitivity setting: targets will be detected even out of the coil’s edge but, as I’ve explained in a previous article, detector indication could be completely wrong. It’s up to your experience (and also your patience to read my articles…ahahahah) to manage those situation at its best. After digging some other nice targets, I’ve decided to move toward a new location where I was able to test the 9″ HF in a more difficult environment. 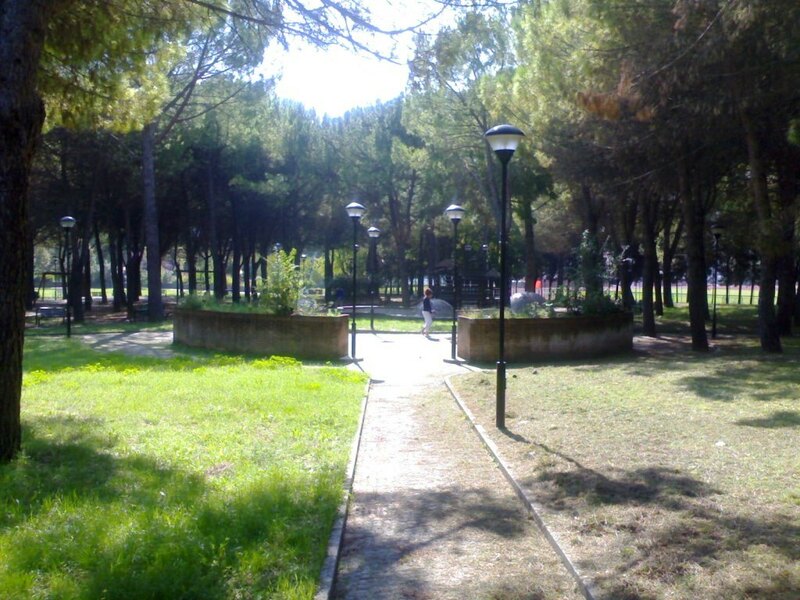 I went to my town’s public park: infested by almost any kind of possible human metallic trash… pull tabs, bottlecaps, iron bits, nails, tin foil, cans, cigarettes papers etc etc etc. I’ve modified my setting raising Reactivity to 3 and creating some smart Notch Disc to reduce pulltabs annoying signals. Using the 15 kHz transformed my Deus V4 in a true COIN MAGNET! So pleasant to use and so productive! The only problem was coming from the crown bottle caps buried just a couple cm deep. But the new 9″ HF has the perfect solution! By simply switching to 55 kHz the machine became almost insensitive to the majority of crown caps. They will become almost undetectable (Note: you will detect them if using 15 or 30 kHz). Even though someone could think this is a flaw, it as a simple and logic explication if you know some VLF basic theory. Most of the crown bottle cap are made of two metals: ferrous and non ferrous. By raising the frequency, the detector sensitivity to non ferrous high condutivity metals will become poorer and poorer. That’s why the 55 kHz frequency is almost “deaf” to the small non-ferrous quantity of metal that’s in the crown caps. When hunting in parks or, as we will see later on, on dry beaches, the use of 15 and 55 kHz will give you a bonus. The 30 kHz, a true all-around option on this machine, could instead be the best choice on mixed environments, where you could struggle with some moderate mineralization, without loosing too much depth and sensitivity to good targets. LET’S GO TO THE SEA? 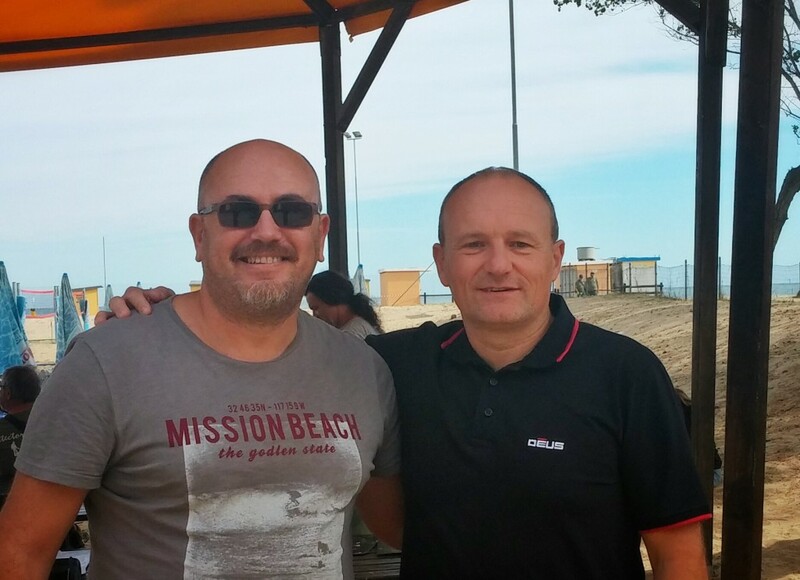 During a little vacation, I’ve bought my Deus HF on Montesilvano’s beach (on the Adriatic seashore). I’ve enjoyed some days on the beach, warm sun, relax, and I’ve had the chance to meet some good ol’ friends and to test the new 9″ HF on a dry/wet beach environment. As you know, the Deus allows the user to detect even on saltwater/alkaline mineralized areas. When I’ve personally met Mr. Alain Loubet (XP President, Founder and Chief Engineer) during the V4.0 prototype launch, he said to me that Deus capability to hunt on those environment was enhanced a lot. Well, he kept the promises! As you know from basic VLF theory, single-frequency detectors (Deus falls in this category even if it can operate with different frequencies) always struggle with saltwater, especially on wet sands, where it’s possible to have the contemporary presence of ferrous mineralization (grey-back sand) and salt mineralization. Even though the Deus could ground balance on wet sand (thanks to the BEACH ON parameter) by changing the compensation range, the standard coils and the older 2.0/3.2 firmwares weren’t too performing on those environments. V4.0 is a real quantum-leap on wet beaches and, even it is still very far from multi-frequency VLF/IB or BBS/FBS machines, the performances are now really neat and brilliant. To be honest, I was more than skeptical that such a high frequency coil/detector could be good on wet beaches. Well, I was pleasantly surprised to find myself wrong on that! The machine works terrific on dry sand (well, I was expecting that) but it really amazed my for its productivity on wet sand and even on small submersion (5-10 cm). Of course you will be forced to do some little modifications to factory settings (correlated to the sand type) but the results were beyond my best forecasts. It’s a fact that the DEUS V4.0/HF could really work on wet sand without going “crazy” and also it will go really well for such an high freq VLF machine. Expect some extra false signal but, with the right combination of Ground Balance, Sensitivity, Audio Sesponse and Silencer, you will be amazed by its versatility and performance. Another very interesting search environment I had the chance to explore with my Deus HF ware the beautiful ploughed fields near Norwich, England, during the annual Metal Detecting Forum’s rally, one of the most famous UK internet forum. Since I’m a delegate of the Federazione Italiana Metal Detecting (www.fimd.it) that was invited to the ECMD (European Council of Metal Detecting) annual international meeting, together with my dear friends Francesco, Edoardo, Giovanni, Matteo and Lucia, I had the wonderful opportunity to go hunting on those amazing places. Low mineralized soils, almost sandy, easy to dig but literally infested by “Green Waste” (i.e. aluminum, tin and iron bits). 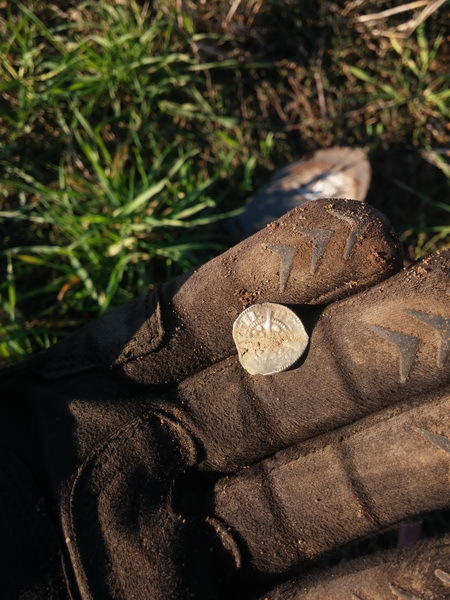 I had the chance to stress the Deus HF on those fields especially trying to find some wonderful hammered coins, so thin and small. Thanks to the high frequencies (30 and 55 kHz) I was lucky enough to find my very first british “Hammie” that was really appreciated by local detectorists. Since the fields were really trashy, I was concerned about target separation. So I kept a very slow sweep pace in order to minimize iron masking. 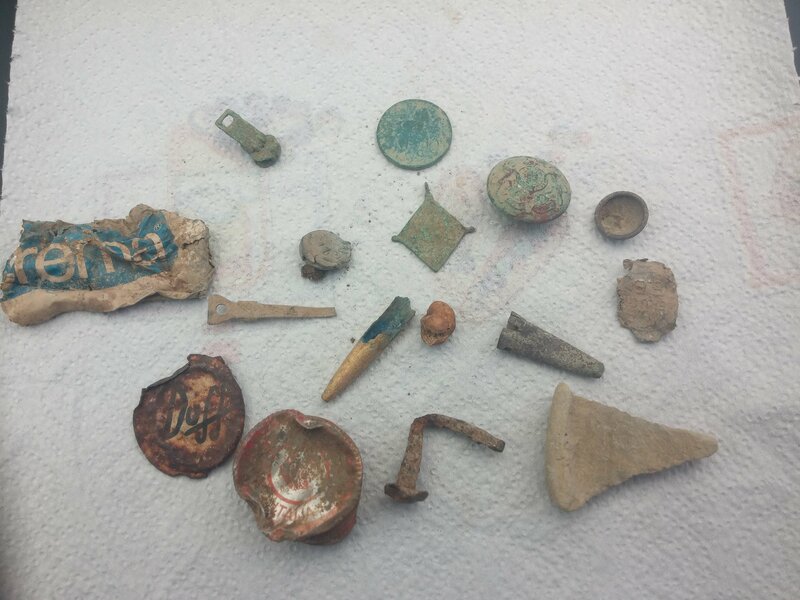 After two days I’ve found quite a lot of targets even though the fields were literally crammed by other treasure hunters from all over Europe. Target centering capability was amazing and I’ve never had problems to pinpoint even very deep targets. As a personal choice, I tend not to use too much the Deus’ integrated no-motion pinpoint. I prefer to quickly sweep over the target while moving the coil backward. When the audio signal stops, the target will be exactly under the coil’s tip vertical. As usual, I’ve also tested the 9″ HF on my personal testbed: five 20 EuroCent coins buried at 5 cm, 12-15 cm (near a rusty iron nail), 20 cm, 25 cm and 28 cm on a hematite mineralized soil. All the tests were brilliantly passed by the machine using each available frequency. I just had some little problems with the 28 cm coin using the 55 kHz but I’m however really satisfied with the general performances. Mineralized bricks tests were passed the easy way, with a neat advantage of 15 kHz compared to 30 and 55 kHz. “Microtargets” test of course highlighted the great power of the 55 kHz that was able to detect a 24k pure gold 1-mm wire buried at 5 cm and a microscopic (0.6 mm wide) hammered coin at 12 cm! Iron masking management is also improved in the V4.0 especially thanks to the new intermediate (2.5) Recovery value that will allow the user to have a more refined choice compared to the V3.2. Great news for nickel or stainless steel coins hunter! In the previous firmware release they were almost “invisible” and difficult to detect even using zero discrimination. V4.0 allows even negative discrimination values (down to -6.4) and finally your Deus will be able to find those coins. After those tests, I’ve brought the HF on mineralized soils with strong EMI emissions too. I was amazed by stability and great performances of high frequencies with those difficult situations. I was expecting that, at least with the 55 kHz, Deus would have been somehow “braken” on hematite rich soils but I was really surprised. EMI, thanks to the wide frequency shift range the user can set, aren’t a problem. In extreme EMI conditions, user could always lower Sensitivity and raise the TX Boost to compensate. I really liked the new HF 9″ coil/detector. Agile, performing, ultrasensitive, versatile and so stable in every condition. Even though it was designed with gold prospecting in mind, it’s so flexible to be used on coin, relic, militaria etc on almost every kind of soil and/or beach. 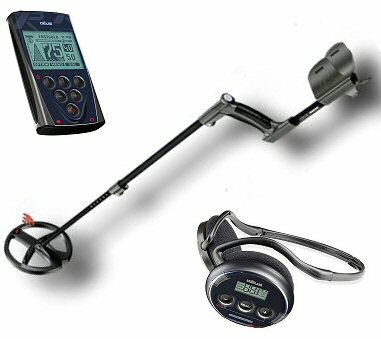 Price tag (I invite you to contact your local dealer for an updated price) is absolutely reasonable, keeping in mind that you’re not buying a simple coil, but a true new brand metal detector. In conclusion, I’d like to recommend the new 9″ DD HF to everyone who wants to really improve their Deus performances, especially with small/thin targets. 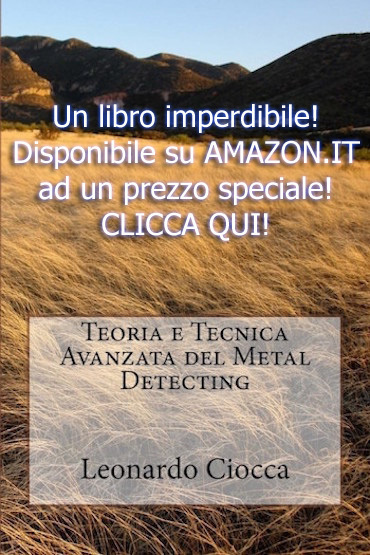 At the end of this review I’d also like to warmly thank the French XP Metal Detector manufacturer and especially Mr. Alain Loubet for giving me the opportunity to test the full system. 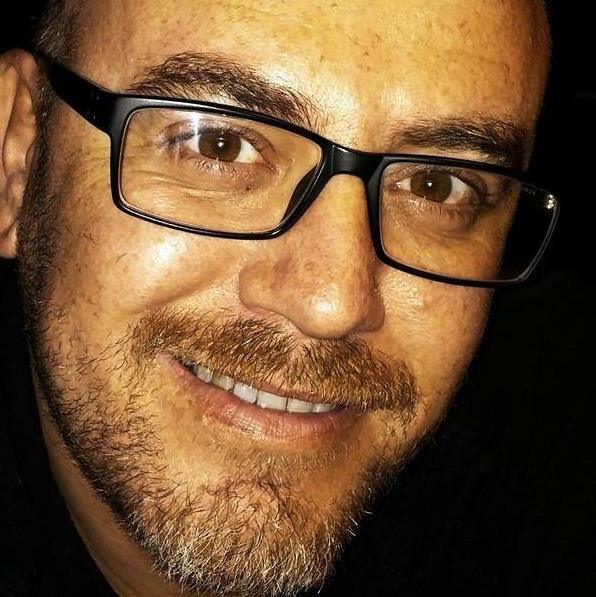 I also want to thank Mr. Gary Blackwell (XP Communications manager) for supporting me and my friends Matteo, Sergio, Riccardo, Alessandro and Gianluca for all their help during the testing processes. So, what are you waiting for? 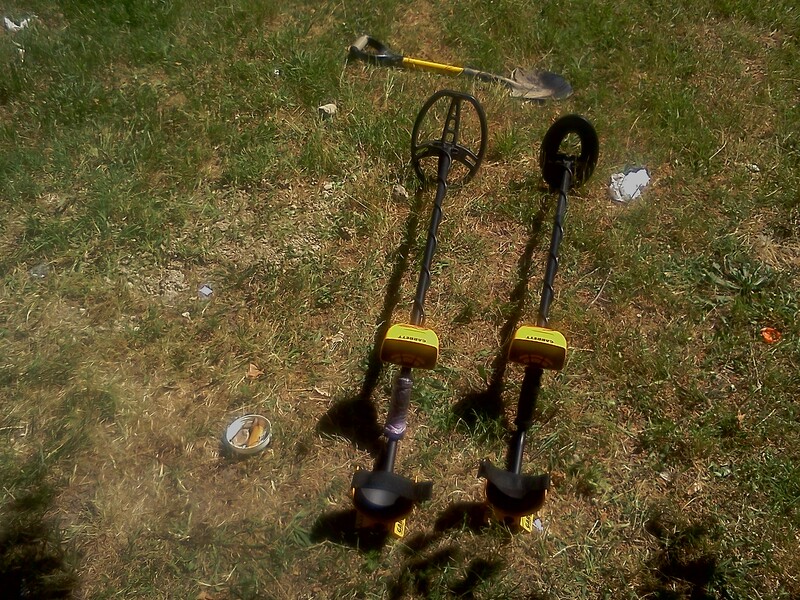 Let’s go metal detecting!